Whoops! Turns out that you CAN NOW GET JUST A SIM CARD from AU. This was not the policy two years ago. A very special thanks to Phil and Joe for cracking this code. Joe just checked in from Chicago with a Unlocked Sprint phone, some how showed the about logo and was issued a SIM card. You must show them this regulation found in your iPhone menu. Look under Settings>General>About>Legal>Regulatory and if you see the above logo, show it to AU and they will issue a new SIM card with a new 2 year contract. No discount on the bill for a new phone, after 2 years my iPhone6 16GB will cost me only $153.50. 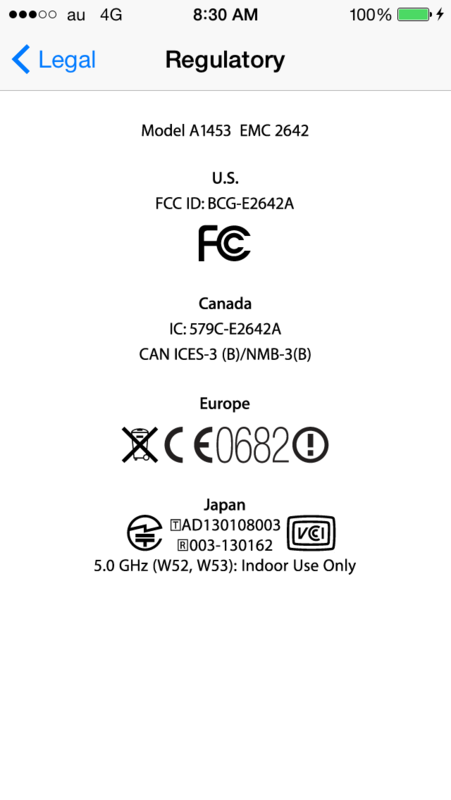 Note: The iPhone 6 from Verizon (Model A1549) is not Japanese Certified!!! Hope that clears things up, i Updated my previous post on the issue. I guess you could show them an AU phone, activate, and then swap. Or i guess you could show them this logo, but that is all on you!